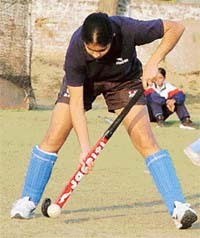 THE sleepy town of Shahbad, located on the GTRoad, has earned the unique distinction of producing several international women hockey players. The contribution of the women hockey players hailing from Shahbad can be gauged from the fact that they were part of the winning Indian team which emerged triumphant in the major hockey tournaments held in the last couple of years. The Asia Cup victory was the latest feather in their cap. JAVED Miandad’s fears that Wasim Akram would reveal the secret of how to play the reverse swing to Indians is at best founded more on his patriotic fervour than the obvious spirit of the game. Nothing wrong in being patriotic particularly in these modern days where victory counts for everything and the means in obtaining it is often overlooked. SHOULD we or shouldn’t we? Should the newly discovered scientific gadgets, if we may call them so, be used in umpiring in cricket or should we continue with the trusted way of believing in the "neutrality" of the men in white? This issue is not only being hotly debated in the International Cricket Council but also among all followers of the game, most of whom strongly believe that umpires are only human and are bound to make mistakes, specially under pressure in a close game. THE first woman to referee a Mexican first division soccer match had a torrid debut when she sent off two players and gave a penalty to the home side in a game between Irapuato and America. 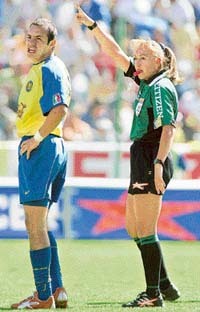 Virginia Tovar, the first female referee in Mexico’s professional soccer league, makes a call alongside America’s Cuauhtemoc Blanco, in her debut match between Irapuato and America, during their Mexican League Championship soccer match at the Sergio Leon Chavez Stadium, in Irapuato on February 22. THE sleepy town of Shahbad, located on the GTRoad, has earned the unique distinction of producing several international women hockey players. The contribution of the women hockey players hailing from Shahbad can be gauged from the fact that they were part of the winning Indian team which emerged triumphant in the major hockey tournaments held in the last couple of years. The Asia Cup victory was the latest feather in their cap. The achievement of the women hockey players attains greater significance in the backdrop of their humble background. Hockey has practically transformed the lives of the Shahbad girls. And hockey has given them hope of a bright future and better prospects. International level hockey players hailing from Shahbad include Suman Bala, Nutan, Meenakshi, Simarjeet Kaur, Balwinder Kaur, Kiran Bala, Gurpreet Kaur, Jasjeet Kaur, Rajni Bala, Rajwinder, Gagandeep Kaur and Surinder Kaur. The herculean task of ensuring that women hockey players of international standard bloom in Shahbad has been achieved by one man, Baldev Singh. He is the coach and mentor for the girls. He is also a terror on the field and a father figure off it. Baldev Singh has single-handedly transformed the small town girls into fighting machines who are capable of taking on even the toughest. The dedication of Baldev Singh coupled with the hardwork of the young girls has been largely responsible for the success of the Shahbad girls in the hockey field. The coach has proved beyond any shred of doubt that proper coaching is the key to success and the ability to spot talent is an important ingredient. Talking to The Tribune, Baldev Singh said that he ensured hardwork was put in by the girls. "I am a hard taskmaster and the girls know it," he said. "Indeed I run it like an interrogation centre," he says with a laugh. Baldev Singh said proper coaching helped in making the girls rough and tough. "I coach them in a manner which makes the girls physically as well as psychologically fit. I am happy with the performance of the girls who have been coached by me. The contribution of the Haryana Government is significant," he said. To help the girls get a feel of the Astro-Turf, a small patch of the turf has been placed in the Shri Guru Nanak Pritam Girls Senior Secondary School. The school is the playground for the girls, who can be spotted practising in the morning and evening. Baldev Singh does not hesitate to punish any girl who is late even by a few minutes. "I have just punished a girl for coming late by 5 minutes. There is no question of arriving late", he said. Interestingly, Jasjeet Kaur who was instrumental in India’s win over Japan in the final of the Asia Cup, has been coached by Baldev Singh. The 16-year-old Jasjeet Kaur happens to be just one of several girls who have been coached by Baldev Singh. "Coaching and spotting talent is a continous process. Jasjeet is not the end since there are many more promising hockey players waiting in the wings," he opined. Incidentally, Baldev Singh has got support from the local residents of Shahbad. 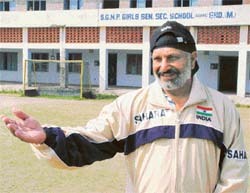 Mr Manmohan Singh of Unique Hockey Welfare Society said Baldev Singh had a free hand in training the girls. "There is no interference from our side. We have told him that we want results and he has achieved significant results," he said. Mr Manmohan Singh said the policy of ‘catch them young and training them well was working. "The hockey nursery has a number of promising young hockey players. With the success of Shahbad girls in international hockey, more interest is being generated among other girls for playing hockey," he said. He pointed out that besides Asia Cup, the Shahbad girls were part of the hockey team which had done exceedingly well in Federation Cup, National Games, senior nationals, junior nationals, Nehru hockey, Afro-Asian Games and Commonwealth Games. The performance of the Shahbad girls in international hockey encouraged the Haryana Government to lay an Astroturf at Shahbad although it was earlier planned for Ambala Cantt. The women hockey players of Shahbad attibute their success to Baldev Singh. "Without his training, it would not have been possible to get a berth in the Indian hockey team," Jasjeet Kaur said. Jasjeet said their skill and stamina was superior to that of hockey players from other countries. "I will do whatever is told to me by the coach," she said. Even the family members of the girls are in agreement. "Baldev Singh knows best. It is for him to nurture the girls and he has shown that girls from humble background can reach the pinnacle of glory," a proud parent said. Amar Singh, grandfather of Jasjeet Kaur, said he was very happy with the performance of the Shahbad girls in the Asia Cup. "Jasjeet reports for practice at 5 am daily and Baldev Singh takes pains in polishing her talent," he said. JAVED Miandad’s fears that Wasim Akram would reveal the secret of how to play the reverse swing to Indians is at best founded more on his patriotic fervour than the obvious spirit of the game. Nothing wrong in being patriotic particularly in these modern days where victory counts for everything and the means in obtaining it is often overlooked. But somewhere down the line nearly everyone, at one stage or the other, has tried to live "within" the spirit of sport, in particular when it concerns cricket. The term cricket has some special connotations. The most important one is that it is synonymous with gentlemanly behaviour. In fact it has often been used to portray honesty and dignity. It is very much British in origin and the aptness of its usage is reflected in the incident when a British once compared his country with Russia. He said that while they played cricket, the Russian national sport was chess. The implication was too obvious. It meant that cricket was a sporting game while chess was all calculations and manoeuvres; completely shrouded in secrecy and stealth. ‘It ain’t cricket’ is a favourite phase that used to be, and still is, flung at anything that went against the spirit of the game. The phrases — sporting chance, the benefit of doubt and other such terms, so abound this game. Though things, however, have changed, like the colour of the flannels, the spirit of it prevails and is commended. And Miandad, without perhaps realising that he, too, has some of this spirit. Despite his recent utterings, Miandad, as Wasim Akram reminds us, spent considerable time with the Indian captain, his deputy Azharuddin and others while India was preparing for the Lord’s Test in 1966. Wasim Akram tells us that even the great Vivian Richards was there as the Indians sought help to tackle the seam and swing moment. Javed was then a perfect ambassador for cricket. It was an entirely Indian crowd at Bangalore which rose to applaud the Pakistan cricket team after they beat India some years ago when the relations between the two countries was anything but cordial. And then there is the case of Zaheer Abbas giving valuable tips to Azharuddin, helping him to get over some flaws in his batting, tips which Azhar used to score heavily against Pakistan. No one has yet accused Zaheer Abbas of being anti-Pakistan. Cricket’s principles have been applied in other games too. There is the instance of another day, another sport, in a totally different world. The famous Jessie Owens, the super athlete of the 30s owed his long jump gold medal in the 1936 Olympics in Berlin to German champion Luz Long. During the qualifying rounds when Owens "fouled" his first two efforts and another foul would mean that he would be out of the competition. Long suggested to the American that he should mark several inches before the takeoff board and make the jump. Jesse Owens did just that and made the grade. What happened in the final is now history. Jesse jumped to a new Olympic record of 16ft 5`BD ins, while Luz Long who helped him qualify in the first place was second. Luz never regretted his gesture one bit. There is another case of De Stefano, the fiery Argentine forward with Real Madrid and European ‘Footballer of the year’ and his team-mate, the newly arrived Puskas of the Hungarian team. At the final match of the league series, Puskas and Stefano both had a tally of 24 goals each and the one who scored in that match would be earn the title of ‘Footballer of that year’. At almost the final minutes Puskas had an open goal in front and instead of scoring he passed the ball on to Stefano and that was it. Stefano scored and went on to become the ‘footballer of the year’ for the record third time. That small gesture sealed their friendship. Football has another story to offer, of more recent time. In fact last year. It is the one about a German orthopaedic surgeon, a staunch supporter of Bayer Munich who treated Michael Owen of his niggling knee problem that had kept him away from the game for months and for which the British experts did not have an answer. A fully recovered Owens scored a hat-trick against Germany in Munich and helped England drub them 5-2 in the European Cup qualifier return match. Among those watching the game was the orthopaedic surgeon. Sport is not just all about excelling but also about camaraderie and appreciating the opponent. Sport should and does most often transcend boundaries. Which is why coaches go over to other countries for scouting talent, encouraging them and nurturing them. Football again provides many such examples, the transformation of the English game by the French is one of the many. The fiery Frenchman Cantona alone is reported to have brought about the style of the Manchester United play from the hard kicking and hard running which was the trade mark of their game till then. Later two French coaches, Wenger and Houillier, made tremendous difference to the styles of premier clubs. The way Beckham has been able to mesh with the high profile Real Madrid is another instance of the spirit of the players and the game. Thus it is rather unfortunate for Javed Miandad to fear about Akram teaching bowling tricks to the Indians or that matter some Australians cribbing about Bruce Reid helping out the Indians down under. No New Zealand cricketer has ever questioned John Wright’s loyalty and patriotism because he is coaching the Indian team, and was part of it when India toured New Zealand and when the latter toured India. Cricket and sport. SHOULD we or shouldn’t we? 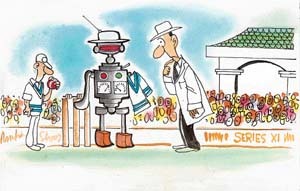 Should the newly discovered scientific gadgets, if we may call them so, be used in umpiring in cricket or should we continue with the trusted way of believing in the "neutrality" of the men in white? This issue is not only being hotly debated in the International Cricket Council but also among all followers of the game, most of whom strongly believe that umpires are only human and are bound to make mistakes, specially under pressure in a close game. They are of the view that gadgets should be used as much as possible in cricket since the margin of error is much, much less, than the human eye. But the traditionalists say that use of gadgets would take away much of the charm of the game which once upon a time, to use an old cliche, was called a "gentleman’s game". And given the strong feeling among both groups it is doubtful whether the debate would end soon! The two instruments which some people want to be used on the cricket field by the umpires is the snick-o-meter and the hawkeye. The former registers the finest of snick on any cricket bat while the second instrument (which helps in adjudicating leg before wicket decisions) judges in quick time whether a delivery which hits the pads of the batsman would have gone ahead and claimed the wicket. Both these instruments are being used for quite sometime by television, and successfully too, and there is no reason for the International Cricket Council not to permit their use in actual play with the third umpire sitting in his room and seeing the replays while coming to a final decision. The results of the instruments have often been in variance with what was actually decided by the umpires in the middle. To start with the instruments can be used on an experimental basis before being permitted to be used generally, say by the next World Cup, to be held in the West Indies in 2007. In fact the concept of using a third umpire in cricket came into existence quite recently. In the good old days when cricket was still a "gentleman’s game" the umpire used to ask a fielder whether he had taken a catch cleanly or whether the ball had sailed over the ropes for a six before giving the appropriate signal. Now no more. With so much at stake (both money and honour) it is third umpire who decides not only whether the fielder has taken the catch cleanly or not or whether the ball has sailed over the ropes for a six but also things like stumping and run outs which earlier were left to the umpires in the middle. If the game can accept the limited role of the third umpire why not bring in the other gadgets into operation which have proved their worth in international match conditions. Modern cricket has a lot at stake. Not only is the national pride of the player at stake but also the money (which nowadays is quite substantial) but also the reputation of the player. For example every time a player like Sachin Tendulkar is given out caught behind or leg before, questions are asked whether the decision was correct? But with the use of such devices the "neutrality" of the umpires could be upheld. Cricket is not the only game which is changing. In tennis the line judges have been replaced by the electronic eye and after an initial opposition both by the players as well as by the tennis officials their use is common with simply no complains. Then why not in cricket. STEPHEN Fleming, the captain of the New Zealand cricket team, deserves congratulations for his innings of 108 in the one-day match against South Africa. His knock included 12 fours and two sixers. It was his sixth century in one-day cricket and he has become the first New Zealand batsmen to cross 6000 runs in the shortened version of the game. The poor performance of the Indian cricket team against Australia in two semifinals has let down every cricket fan. The way the team fizzled out in the second semifinal reminded one of the final of the World Cup. The Himachal Pradesh Cricket Association has done a commendable job by organising the Duleep Trophy match between South Zone and East Zone at Dharamsala. It is an effort worth praising and the association deserves a pat for their brilliant work.